Morgan is 8. 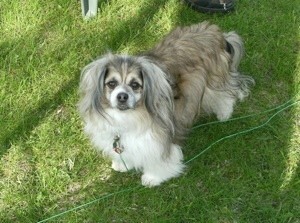 He is a Pom and Pekingese mix. We got him after the death of our dog, muffin's mom, at age 16 of natural causes. Muffin was not her normal self so I thought a playmate would help and it did. He likes to go riding in the car and shopping at the pet stores. He will take my socks off at the end of the day and then he will check my hair for fleas. Cute lil guy and love his face expression or is just the eyebrows, cutie. Wow, what an adorable little boy! The expression is priceless!